In order to reach the next degree, which is called the “New Year,” we need to be ready for the new property of bestowal. And it comes when a person equalizes black and white, being above the screen, above the egoistic desires. Nothing prevents him from giving to the other, nothing matters—he does not set any conditions, just to be able to give, and this is always possible. Therefore, once a person reaches the state when he only wants to bestow and is able to bestow, then he has corrected and prepared himself for the next degree, for the New Year. All the preparations for the New Year mean the willingness to work in the dark and the Light completely equally in all the desires and thoughts that are revealed today in our mind and heart. And when we finish this degree and can bestow above all the darkness, since this bestowal does not apply to us, to our feelings, we come to the perfect prayer. My only desire is to bring pleasure to the Creator, that is the most important thing to me. This means that I establish the Creator to reign over all the earth (Eretz), over my entire desire (Ratzon). Above all my desires for my own benefit, whatever they may be, there is the Creator Who is most important to me. This means that I make Him reign over all my desires, and no matter what happens inside them, I do not care. The main thing for me is to increase and raise the Creator. This symbolizes the holiday of the beginning of the New Year and its prayers: the King to whom we address our prayers. Before the holiday, throughout the previous month Elul, we need to prepare ourselves so that we come to the beginning of the year. Otherwise, there is no beginning of the year; there is no time in the spiritual world. Today, we celebrate the beginning of the new year. This holiday came down to us as a branch of the spiritual root. But if we rise by this branch back to the root, we can celebrate the new year any time: any moment, any day that will become the beginning of a new degree for us. In total, there are 70 degrees (HGT NHYM of Zeir Anpin), and we have to ascend them all. Malchut must adhere to this ladder. A new year begins at every step, so a person’s life is estimated at 70 years. Question: In fact, we need only to correct our egoism that prevents connection. Then, why do we develop the entire methodology of integral education? What else can we talk about besides separation and unity? Answer: Indeed, nothing else exists. However, when you begin to go deeper, when you enter, it is found that there lies the entire higher wisdom. It is inherent in the desire to receive and in the desire to bestow. After all, all our actions converge in this dualism. There is only the “plus” and the “minus,” two opposing forces. However, look at what they produce by interacting with each other in this world: all the sciences, including physics, chemistry, biology, zoology, astronomy, medicine, psychology, and so forth. Everything is built on the interaction of two opposites, the entire world, the universe with its set of laws and myriad details. In spirituality, we add to this the screen and the Reflected Light. The response from the minus, the material that wants to be like the plus—that is, the Light—and then something absolutely new emerges. It is not just the relationship between the plus and minus, but their relationship between each other. The minus begins to relate to the plus completely differently. It rises above itself, its knowledge, its mind, and acts opposite to its own nature in the likeness of the plus. The created being learns from the Creator what to do, and it does this. Much more complex laws are manifested here, which we study. This is great, truly boundless wisdom. It grows seemingly from nothing, from two opposites, one of which only wants to be like the other. It would seem, let it become like the other. However, you open the door slightly, and, behind it, you will discover the ocean without end. Question: Out of the 60 men in our group, only 15 go out to meet the public to disseminate integral education. How can we harness others to this mission? Answer: If only 15 men out of 60 go out to meet the public, what do the others do? Is it too hard for them to carry a bag, a pointer, a board or anything of the kind and to participate in the dissemination in some way?! I am serious! We have to participate somehow since it is necessary for us, I understand that 15 people is quite a lot. If 25% of the group goes out to the public it is great! But others should also participate and even help passively. They can collect questions, help the others, make contact and answer questions about organizational matters. Eventually a greater desire will be spurred in them. What’s important is that they participate and feel the general collective power. What does it mean to go out to the people? We have to feel what they need and connect to their desires, connect their small desires and absorb them. Therefore I say “make his desire your desire.” This is called “love thy friend as thyself.” When you begin to absorb their desires, you will begin to feel that you have to satisfy them just like a child’s desires. Then you get a totally different feeling regarding the group, the teacher, and the Creator and you begin to demand from them. In the News (from BBC News): “Taking cocaine can change the structure of the brain within hours in what could be the first steps of drug addiction, according to US researchers. “The place or environment that drugs are taken plays an important role in addiction. In the experiments, the mice were allowed to explore freely two very different chambers – each with a different smell and surface texture. “’This gives us a possible mechanism for how drug use fuels further drug-seeking behaviour. My Comment: Changes in the structure of the brain lead to a complete change of personality; dependence on fulfillment from narcotics makes a person weak-willed and utterly unfit to work on himself, on spiritual evolution, and removes him from society. He is useful for the old, capitalist system as a vegetable who needs only a new dose, but for a new, altruistic social structure, he is completely unsuitable. Question: Why do I feel that I need to be corrected, but it doesn’t happen? Answer: That cannot be. If you demand correction, then it must immediately happen. It seems that you demand, but is not for correction as long as you are just saying this with words but aren’t feeling it in your heart. You need to check yourself. There cannot be such a thing that someone is refused correction. If you truly want to correct something in you, if you have clarified that this is a corrupted characteristic, see it before you, and you act in order to bestow without regard for any benefit for yourself, then it will be corrected. The system already exists and it cannot be otherwise. It acts like a sound car and it cannot be that it doesn’t work. Besides you, no one in the world has free choice, including the Creator! It is said: (Psalms 148:6) “He gave a law and it will not be transgressed.” The Creator cannot suddenly want something or not want something, as if a higher power could change His decision. We don’t understand how this system is built. It is found in the state of the final correction (Gmar Tikkun). And you are found in a completely corrupted state, and you need to reach from one extreme to the other. To do this, you are given Partzufim and “spiritual worlds,” a staircase of steps, and on every level there exists a unique Light that works on you. Besides you, no one else can do anything! So how about the rest of creation, all seven billion? Okay, let’s suppose that those who don’t have a point in the heart don’t have free choice. But what about those who have a point in the heart, because they have free choice can’t they intervene No, they cannot, everything depends only on you. Everyone needs to say this about himself, and this is truly so. Only I–in my section in regard to my soul, in regard to my part of the work—possess free choice. And no still, vegetative, animate, or speaking, including the Creator can intervene. Everything else other than me is the system. Therefore you can scream, cry, beg, but you are facing a system, a machine. If you have already learned how to run it, then you can make it work. And if not, then it is necessary to learn more about how to do this. That is all; there are no excuses. Question: How can I be sure that I am developing? How can I verify that I am not standing in place and not found to be regressing? Answer: My development is determined according to how much I am conscious of my dependence on the other, on the friends, on the teacher, on the learning, on the entire world, and on the Creator. On one hand, these means open me; on the other hand, I discover my implementation in them. If everyday I feel more of a need for a group, for support, for the Creator, for the Light that Reforms, if I feel more dependent upon them, if I am weak, powerless, at a loss without them, this indicates I am advancing. The spiritual path differs from the physical world in which, on the contrary, we judge advancement according to independence and a lack of dependence upon others. When a person develops spiritually, he feels more clearly how much he requires and depends on everyone. I cannot be without the desires of the lower levels and without the help of the higher levels. So who am I? I am the one who builds the right relationship, expanding the connection with the general public and with the spiritual levels by way of the group. Without these two components I am nothing. After all, I come to the group with my personal desire, and therefore, I am egoistic. This is enough for a start, yet a year goes by and what’s next? If I continue my path with my personal needs, then I will only get one thing: the exercise of the ego. Therefore I need to go out to the external society, to the general public, to the greater world, and attach the desires of the people to myself in order to bring good to them. I want to bestow to them, even though in the meantime, it is egoistically. I am cloaked in someone’s need and this need brings me to a group; with it, I turn to the Creator, and only through this appeal do I get an answer. Now I am directed towards bestowal at least in some way, and this is thanks to my going out. And conversely, if I don’t go out and am enclosed within a group, then I am working only with my personal egoistic desires, with no chance of success. This is the reason that it is so important for us to “go out to the public.” The Kabbalists of previous generations could not do this because the appropriate conditions had not yet been created in the world. This was very painful for them, like it is for a mother who is incapable of nursing her infant. Today, however, all the necessary conditions have been created and we must penetrate into the desires of the people in order to join with them to connect in a group. And then by means of this connection, we can raise their desires to the Creator. It is written about this: “Israel, the Torah, and the Creator are one.” This must be the intention that precedes action. This intention may come from either the Creator or the creature. On the levels of the still, vegetative, and animate, it comes from the Creator and everything is found to be under His control. Yet we want that the intentions will come from us; we want to rise to the level of the “speaking.” Since this is called Adam (man), this is what forms and builds the intention. The intention itself is essentially the Adam in us. So I form the intention, on the basis of those desires that I received from the “people,” from the people to whom I turned to for their correction (1). The Creator inserts these desires into them after sending them certain troubles. When I discover this (2), I take these troubles upon myself, and, in fact, here the aspiration for bestowal is already found. Now I have a desire that is equipped with a Masach (screen) and intention. Even though, in the meantime, this is not true and is egoistic, yet together with this, the system gets its future spiritual form. This is because through my turning to people, I at least emulate bestowal and work with their desires and not mine. I could never hold on to a screen and the Returning Light with my particular desires. This is because if I lack something, I remember the Creator only so that He will satisfy my needs. Yet now, when I am equipped with the desires of the other that don’t belong to my ego, I am truly ready to think about the Creator. Thus, the foundations of the spiritual vessels (Kelim), desires, are laid in an egoistic appeal to the people with which I can to turn to the Creator with the request: “Help them!” This action teaches and brings me to a kind of spiritual image, and therefore in response, the Surrounding Light (Ohr Makif) or the Light that Reforms arrives. To do this, I connect with the group and we raise the “prayer of the many” to the Creator. Yes, it is still egoistic and entirely false because we are not yet corrected, but even in such an uncorrected request there is a grain of spiritual truth. Its nucleus is already correct. After that, Surrounding Light arrives from the Creator by way of the group, but it doesn’t reach me directly. 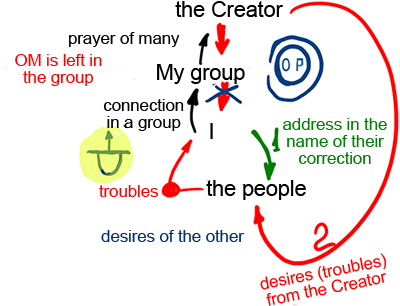 It is left in the group and this helps us to connect until our additional connection includes the outer circle within it and awakens the discovery of the Inner Light (Ohr Pinimi). So the desire of the other is extremely important. It allows us to build the entire chain in the right form. And after that, we receive the Light that Reforms, and with its help we are truly concerned about the others and their desires, and they are connected to us more and more as if they are ours, and they oblige us to be concerned about them more than about our personal needs. Anyway, we are always working with the desire of the other. And therefore dissemination establishes the right arrangement for the entire process, shaping us as necessary. Without this we have no chance to succeed.